People will throw statistics and numbers around to prove their point or suit their needs without hesitation. In the automotive world, we've heard all of them- horsepower per liter, unsprung weight, and the list goes on. One number folks tend to pay closer attention to is the horsepower to weight ratio, as it often helps present a clearer picture of what is really going on with a car in terms of performance potential. 352 horsepower might sound great, but drop it in a 6,200-pound Suburban and things get boring quickly. On the other hand, shoehorn that power into a 2,750-pound Honda and you're in for some excitement. That's exactly what Andy Smedegard has planned for his entry in the 2014 OPTIMA Ultimate Street Car Invitational. 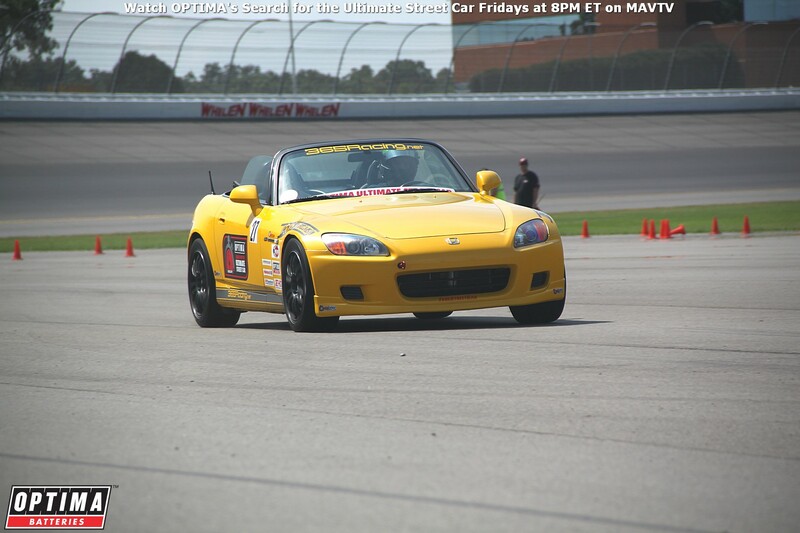 Smedegard qualified for the OUSCI, by besting the field in GT2K at the Michigan Ultimate Street Car Association event last month in his 2001 Honda S2000. Classes aside, Smedegard actually had a very competitive day overall, with times in the BFGoodrich Hot Lap Challenge and RideTech Autocross that would've easily placed him inside the top-10 in the very competitive GT3K class in both of those events. That happened in a car that currently lays just over 200 horsepower to the tires. It's not hard to imagine the potential if Andy is able to successfully increase his Honda's power output by nearly 70% without substantially increasing the weight of the vehicle. The end result would be a Honda S2000 with a power to weight ratio that would put it in the same neighborhood as cars like the Porsche Carrera 911 S and the Mercedes-Benz E63 AMG S. So how does one go about adding 70% more power? There are a multitude of ways, but Andy will be choosing forced induction via a supercharger. "I’ve had it sitting on the shelf for a while and wasn’t sure if I wanted to install it," says Smedegard. "The car has been dead reliable so far and I don't want to change that." However, after winning a close battle in Michigan and getting the OUSCI invite, Andy decided to go for it. Fortunately, he has a fair amount of time to get it dialed in before heading West. Getting the power into the car, but putting it to good use is another matter entirely. If there's one thing that can be said about some of the entries in the OUSCI over the years, it would be that many of them would run out of driver talent well before they ever ran out of power. However, as the cars have continuously gotten better over the years, the drivers have as well. Where it wasn't uncommon for many entrants in past events to have no prior track experience, the new qualifying series in 2014 means everyone who is in so far has spent at least some amount of time doing everything on a track that will happen at the OUSCI. That is certainly the case for Andy Smedegard, whose driving resume includes ten years of autocrossing, five years in HPDEs, two years in NASA TT events and two ChumpCar races. Not only does Andy know his way around a track, he knows the importance of preparing both car and driver for action. Since his run at Michigan, Andy continues to log as much time behind the wheel as possible, while further dialing in his Honda's suspension. "I've changed the spring rates a bit, I'm trying to dial in the alignment and make some other small suspension changes to get a better balanced car," says Smedegard. While Andy has never run at Las Vegas Motor Speedway, he has been watching YouTube videos and feels his autocrossing background will help him adapt quickly to the unfamiliar course. Smedegard always runs to win, but he knows the competition in Vegas will be tough. He won't be intimidated, but he will be realistic and we're reasonably certain he'll have a great time while he's out there. You can follow his OUSCI preparation on the 365Racing Facebook page and on 365Racing blog. Where does that name come from? Check out those links to see Andy's Honda in action on frozen tundra! Andy also wanted to make sure we acknowledged the support he has received from RS Motors, Quick Trick Alignment, Ground-Control Suspension Systems, BoostedFilms.com, the entire 365Racing crew, and so many other friends and family. Don't forget family, friends, fans and everyone else are invited to watch all the action unfold, as the 2014 OPTIMA Ultimate Street Car Invitational expands to a two-day format at the Las Vegas Motor Speedway, beginning on November 8th. Buy your OUSCI tickets online today!